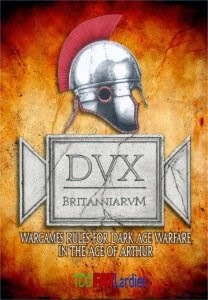 Several of us are currently participating in a campaign using the Dux Britanniarum rules from TooFatLardies. These rules have an inbuilt campaign system that has been very cleverly designed to provide maximum involvement with minimal bookkeeping. The basic system in the rules is for two players, but with the assistance of an article in the TFL 2013 Summer Special (Double - or More - Dux by Chris Stoesen) we've extended this to allow six players. 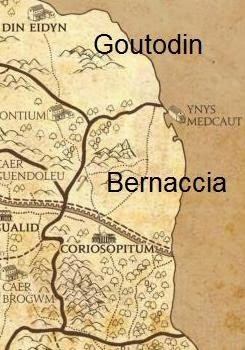 Three of these are Romano-British, one representing the kingdom of Goutodin (modern south-east Scotland) and the other two the kingdom of Bernaccia (modern Northumberland). The former has just the one province, Din Eidyn (Edinburgh) while the latter is separated by Hadrian's Wall into two provinces, Ynys Medcaut (Holy Island / Lindisfarne) and Corstopitum (Corbridge). The opposition forces are generically known as Saxons to the British, though we distinguish them for convenience into Angles, Jutes and Saxons, each led by one player. They attack from the sea or, in the case of the Angles, from forts they've settled along the Wall. Each campaign turn represents a month, and starts with the Saxon players taking it in turn to declare which British province they wish to raid. We don't allow them to gang up, though later on when they progress from raids to full scale battles they will be able to request support from their compatriots, as will the British. However, each player is trying to achieve his own victory conditions by following a particular career path, so these rivalries should lead to interesting decisions to support or not. Watch out for after action reports and campaign updates in future blog posts! Photos by Colin Campbell, who also painted the figures. Welcome back to the Ulster Wargames blog!